The country’s inflation cooled to a 7-month low last month, going below most analyst estimates, but as Bruce Rodriguez reports government still has work to do before inflation could be fully tamed. GOVERNMENT-OWNED and -controlled corporations (GOCCs) remitted a record P40.18 billion worth of dividends to the national government in 2018, the Department of Finance (DoF) said in a statement over the weekend. 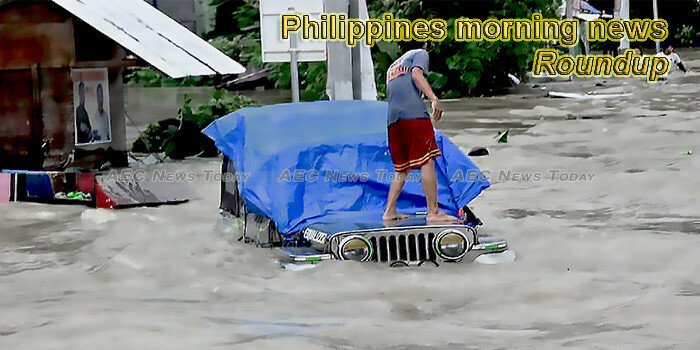 The death toll from a storm that devastated the Philippines shortly after Christmas rose to 126, authorities said on Sunday (Jan 6), adding landslides caused by torrential rain were the top cause. Damage to infrastructure and agriculture caused by the onslaught of Tropical Depression Usman has reached ₱4.2 billion, the National Disaster Risk Reduction and Management Council (NDRRMC) said in its report Sunday. YIELDS on government securities (GS) went down in the first trading week of the year amid lower inflation prospects. IT will be difficult to slip the second tax-reform package past the Senate before the 17th Congress ends in June, the country’s trade chief has conceded. Sabah Chief Minister Mohd Shafie Apdal is expected to discuss several important issues with as yet unnamed leaders from southern Philippines when they visit the state capital next week. The Batangas Port Planners and Development Inc. (BPPDI), one of the companies under the Leviste group, will develop a 40-hectare port and mixed-used facility in Batangas City. THE World Bank (WB) said its assistance to farmers and fisherfolk in the Philippines has increased their income by 15% over four years, or halfway to the 30% target of income growth by 2021. Around 3,000 affected workers displaced by Tropical Depression Usman in the Bicol Region will initially benefit from the emergency employment assistance of the Department of Labor and Employment (DOLE). An independent children’s rights organization has underscored the need for the combined efforts of parents and government agencies that will implement the First 1,000 Days Law to completely eliminate malnutrition in the country. Capital Economics, a London-based research agency, said it expects the Bangko Sentral ng Pilipinas to start easing its policy stance as early as the second quarter this year, amid the declining inflation rate. PHILIPPINE Telegraph and Telephone Corp. (PT&T) has struck a deal with security solutions provider 5G Security Inc. to empower both companies to provide cybersecurity solutions to enterprises in the country. The city government of Davao will open an online payment system to provide business owners a more convenient way to settle their taxes starting January 7, 2018, City Treasurer’s Office acting head Erwin Alparaque said. President Rodrigo R. Duterte said that the government is “ready to spend” approximately PHP46 billion to build at least 300 sturdier houses in the Bicol region in the wake of Tropical Depression Usman. The Sugar Regulatory Administration (SRA) has set an ideal price cap on sugar, a move seen to stop profiteering in the local market, especially when farmgate prices for the sweetener are low. THE Bangko Sentral ng Pilipinas (BSP) is likely to loosen its monetary policy as early as the second quarter of 2019 on account of easing price pressures, according to London-based Capital Economics. Some of the country’s conglomerates are embracing more sustainable practices including a major reduction in the use of plastics. The Philippines is one of the countries in developing Asia where factoring and receivables finance is expected to take stronger hold with the passage of the Personal Property Security Act (PPSA), according to a factoring executive. The Taipei Economic and Cultural Office in the Philippines has once again provided various scholarship programs for qualified Filipino students. Local hotel chain Astoria Hotels & Resorts (AHR) has opened its second sustainable resort in Boracay Island, Astoria Current, with development cost of P1.5 billion. The number of fireworks-related injuries (FWRIs) has risen to 319 after the Department of Health (DOH) on Saturday reported 31 more cases recorded in various regions of the country from 6 a.m. of January 3 until 5:59 a.m. of January 5.
International Container Terminal Service Inc. (ICTSI) will soon be operating the South Port Container Terminal (SPCT) in Sudan. Socialized housing producers are urging the Housing and Urban Development Coordinating Council (HUDCC) and the National Economic Development Authority (NEDA) to reconsider and increase the present price ceiling for socialized housing from P480,000 to P533,333. The political party of Daraga Mayor Carlwyn Baldo said Sunday it has withdrawn support for his re-election bid after he was tagged as the alleged mastermind in the killing of Cong. Rodel Batocabe. A cooperative in Sarangani province is expanding its abaca production area to about 1,000 hectares as it started selling its products to China.